SEIU’s campaign to take over key UNITE HERE locals suffered a major setback yesterday, as 2300 workers at the Philadelphia School District voted by a 2-1 margin to remain affiliated with UNITE HERE rather than switch to SEIU. The New York‑based SEIU 32BJ had led efforts to win the election, viewing Philadelphia as a stepping stone to its larger goal of taking over all of UNITE HERE’s food service locals. Instead, workers dealt SEIU a crushing 1,121-551 defeat. UNITE HERE’s victory comes after recent wins over SEIU in St. Louis and among Delaware North company food service workers, indicating that not only has SEIU’s attempted raids failed, but UNITE HERE is even stronger today than when SEIU’s attacks began. Yesterday’s UNITE HERE victory in Philadelphia does not end Bruce Raynor’s and SEIU’s hostile takeover campaign, but it leaves them without a clear target for future membership gains. SEIU pulled out all the stops in Philly, and yet its attempt to woo workers was soundly rejected. SEIU long justified its raids on UNITE HERE on the grounds that food service was logically the jurisdiction of the former UNITE, not the current UNITE HERE. Reports were that SEIU 32B head Mike Fishman was one of the strongest advocates for SEIU intervening in UNITE HERE’s internal fight, as he believed that SEIU could capture UNITE HERE’s food service local in Philadelphia and elsewhere. Dominga Gonzalez, a noontime aide from Luis Muñoz Marin School, echoed Pridgen: “We would like to ask our brothers and sisters in District 1201 to tell SEIU, their international union, to accept these results and drop their legal appeals, so we can all begin bargaining our new contracts. This is UNITE HERE ‘s third major victory for in recent months in its struggle against SEIU. As I wrote on August 26, 2000 Delaware North workers ratified a contract with UNITE HERE, thwarting a SEIU raid. Three weeks ago, 2300 members of Local 74 in St. Louis voted to reaffirm their affiliation with UNITE HERE. A consesquence of SEIU’s attacks on UNITE HERE was the latter leaving the Change to Win Labor Federation and returning to the AFL-CIO. 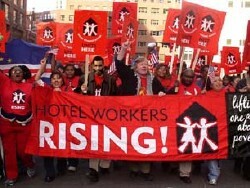 AFL-CIO President Richard Trumka expressed delight at UNITE HERE’s Philadelphia victory. Cutting deals with employers? That’s precisely what UNITE HERE and other labor activists have long accused Raynor of doing. Insisting workers have the right to vote? Isn’t that what just happened in St. Louis, Philadelphia and Delaware North? And some might ask if SEIU is so insistent on giving workers the right to vote, why have they held up multiple elections in California sought by workers aligned with NUHW? And why is SEIU delaying a union election among unrepresented members in Santa Rosa? Six months ago, UNITE HERE was fighting for its very survival. SEIU thought it could starve UNITE HERE financially, and force John Wilhelm to make a bad settlement on Andy Stern’s and Bruce Raynor’s terms. But SEIU should have realized that a union whose members have waged the longest strikes in modern U.S. history would not quickly surrender. And it turns out that SEIU’s attacks galvanized UNITE HERE’s membership, bringing the union to a stronger place today than when SEIU’s raids began. It was UNITE HERE Local 26 in Boston that brought nationwide publicity over the firing of non-union Hyatt Harborside Hotel housekeepers by Obama Campaign Finance Chair Penny Pritzker. When workers across the nation saw UNITE HERE fighting for housekeepers who were not even union members, it sent a powerful message about UNITE HERE’s priorities. And as the campaign against Hyatt goes national, it will become even more difficult for Raynor to convince workers that UNITE HERE does not support their best interests.